Lviv has its own airport, albeit a modest one, so don't expect state of the art slickness. The most convenient places to fly from are London, Vienna or Warsaw. Poland's LOT airlines operates regular flights from London Heathrow with a brief stop in Warsaw. Austrian Airlines also offers flights and these are direct to Lviv, but less frequently. If you're coming from the UK you can also fly via Manchester, again with a short stop in Warsaw. 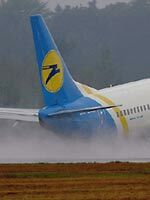 Ukraine's own airline runs direct flights to Lviv from Frankfurt and Kiev. Lviv airport is just 6km outside the city so it won't take you long to get to the heart of the action. As of yet there are no budget airlines flying to Lviv. Lviv's grand art nouveau station, a relic of the days when the city was the capital of Habsburg Galicia, is a spectacular sight in itself. It was recently restored and it's in fine condition. Of course, during the Habsburg days the train journey from Vienna was a good deal quicker - today it's about an 18 hour slog from the Austrian capital. If you're travelling from Poland it's about 11 hours from the southern city of Cracow. Naturally, if you're coming from Kiev, there are daily trains and these take roughly 8 hours to reach Lviv. It's possible to set out on your adventure to Lviv from a multitude of cities across Europe, including Amsterdam, Barcelona, Brussels, London, Manchester, Paris and Prague. Most of these options constitute a fairly long haul, but if you're intending to visit other destinations in Eastern Europe, you'll probably be approaching from Poland. If so, a couple of the more interesting points of departure would be Przemysl or Zamosc. Both of these are worth a look, and they're not far from the Ukrainian border. You can take a bus direct from Przemysl, or if you're on the Zamosc route, head off from Hrebenne. It's an intrepid choice, but if you like an adventure there'll be plenty of thrills in store. If you're coming from the north-west, bear in mind that Polish roads don't have a wonderful reputation, and the Ukrainian ones are also unlikely to win prizes. Motorways themselves are rather few and far between - we don't mind that so much but pot-holes are very much the norm, not forgetting all kinds of slippery surprises when Old Man Winter descends. On the plus side Western Ukraine's straight, tree-lined prewar roads are picturesque, and its only with a car that you'll have complete freedom. For the bold! Wiz Air now fly to Lviv from Luton airport. Can citizen of T&T travel visa free to Lviv? If you drive to Ukraine for the football championship by Japanese, German, French or other car, dont be uptight about auto service. There are branded service stations for Toyota, Honda, Volkswagen, Citroen and many others not only in Kyiv, but also in other cities. Thats why you shouldnt worry about your iron horses, everything will be alright. But only this Travel Guide will help you to find addresses and phone numbers of these service stations. Here its website http://euro2012.ianp.com.ua/index_en.html . So we are waiting for you, guys, in our hospitable cities and noisy stadiums. By the way, if you look through this guide, you'll find a lot of hot spots on the way to the stadium. L'viv is very nice city but it is very difficult to get there.Goverment is gready and they don't allowe budget lines to fly to Ukraine. 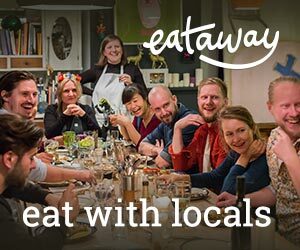 11 hours from krakow? When was this written? 1875? Its 8 hours from Krakow Lviv even on the slowest trains, and usually 2 trains per day, although they are growing. OK - you can get to Lviv from Poland very cheaply by a combination of TRAIN from Ustrzyki Dolny in Poland to Chirow in Ukraine and then grab a BUS from there to Lviv. It's a fascinating train journey across the border, where you will be accompanied by cheerful cigarette and alcohol smugglers who strap thir contraband to their arms and legs (and stuff them into the seats and ceilings of the train in full view of the ticket collector and conductor!) At the border, you will wait for a couple of hours as both Ukrainian and Polish customs officers take their turn to strip the carriages of the contraband whilst the passengers look on good-humouredly. Eventually, everyone climbs back on board to check out what goodies have been overlooked by customs, and head cheerfully back home with their booty - to repeat the whole process the following day. Hysterical! Lemberg ist meine Heimat,ich vermi?e dich.Solltest du nicht an mich traurig sein,ich besuche dir.Keine panik!!! Ich denke an dich mein Stadt!!!! I have taken the bus from Warsaw to Lviv, but it's a tricky journey with an extremely long stop at the border. The bus also had no heat, and it was winter. But it got me there, and it was cheap! The train from Kiev to Lviv is perfectly safe, but I would recommend purchasing the tickets for the entire cabin, unless you wish to share a cabin with a stranger. Lviv is very beautiful city... People there are very friendly... I love UKRAINE!!!!! Hello. 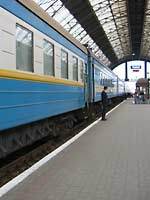 i'wondering that is it safe to getting to Liviv from Kyiv by train. I'll be appreciate if someone give me any advice.